July is here, the summer looks like it’s finally arriving and we’ve all been busy getting ready for the University of Southampton 2013 Open Days. As well as loads of activities and information being organised by the University, members of the SUSU team will also be on hand to answer questions and give a bit of insight on what it’s really like to study here. If you’re visiting , you can look forward to campus tours (hopefully in lovely sunshine! ), visits to Halls of Residence, talks and lots of helpful information and advice. We’ll also be giving talks on student life and what you can get involved in alongside your studies, which will be in the Multiplex Cinema (Building 42) at 10am, 12pm, 1pm and 3pm. 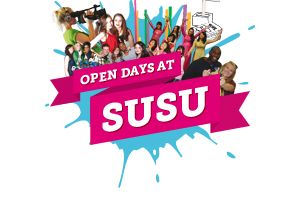 So make sure you come and say hello, and find out about all of the exciting things SUSU has to offer. Plus, don’t forget to like us on Facebook and follow us on Twitter. Friday 5th and Saturday 6th July Open Days are now fully booked, but if you’re interested in coming to see us you can still secure your place at the September Open Days on Friday 6 and Saturday 7 September 2013 by booking online via the University’s website.